THE eclectic Wine Bar / Bistro / Tasting room / Live music venue/ Open to the public / In the midst of the beautiful vineyard at Barons CreekSide! 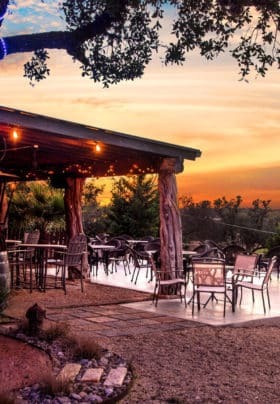 The #1 place to watch the spectacular Hill Country sunset! “THE CLUB” featuring live-music, walking distance from Barons CreekSide cabins, in the midst of our own beautiful vineyard! Open to the public Thursday, Friday and Saturday evenings from 5:00pm – 11:00pm. 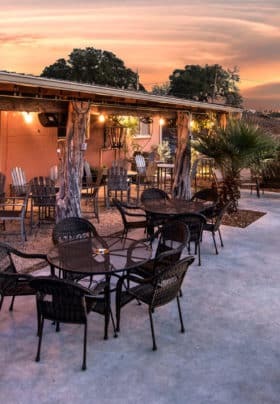 Fine selection of Texas and International wines, craft beers, delicious seasonal European style bistro specialties such as cheese plates, Italian style panini’s, flavorful gumbo, crispy salads, and a weekly specialty (chicken lasagna, fish taco….) Meals priced typically between $10 -$20. Around The Club, we grow our own grapes (Petite Sirah), the only vineyard in the City of Fredericksburg ! Our partner “Kuhlman Cellars” produces premium boutique style wines for us and you can taste them exclusively at The Club. Wine Tastings by reservation on Saturday afternoons. The live music at The Club is never too loud, genre is blues, jazz, Americana, singer- songwriter. Being harassed by licensing sharks, we feature bands playing their own compositions. Our outdoor seating features a fire-pit, heaters and fuzzy blankets for cool nights, fans, and shade in the summer time. 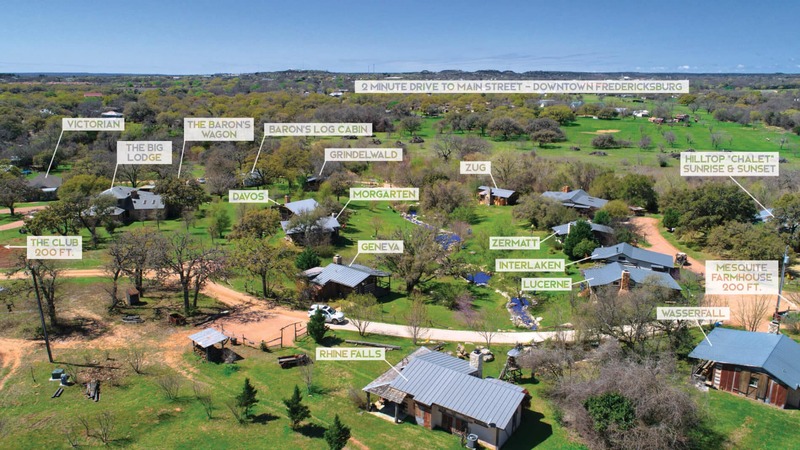 THE place to view the spectacular Texas sunsets. Call 830-992-3421 for reservation or 830 990 4048 to exclusively rent THE CLUB for your private event. Be sure to visit our Facebook page!